The Archive Club chronicles the unique characteristics of Arizona terroir. Crafted in the spirit of camaraderie, our wines capture a moment in time and an expression of place. Even if you don't call Arizona your home, join our community, and become part of our story. This will give you inside access to our special members-only events, exclusive wine releases for your personal library, as well as all the perks that come with being a member of our club. 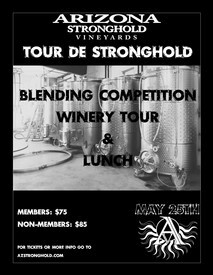 Arizona Stronghold Vineyards' wines are the expression of the fierce and wild Arizona terrain. We pride ourselves on being pioneers and farmers first, who use the landscape of Arizona to produce unique and prized wine that will compliment any occasion or collection. Each harvest is meticulously cared for year-in and year-out and every wine and blend is treated as an individual. We recognize that quality fruit is the key to all winemaking endeavors. Our wines showcase the originality of the southwest highlands and accent the terrain, which can be enjoyed in each glass of Arizona Stronghold’s amazing Site Archive wines as well as our signature, regional blends. The varietals are grown near Willcox, Arizona at our Bonita Springs Vineyard as well as fruit sourced from various other local vineyards. We are focused on crafting Arizona grown wines that express the highest quality and value our wild and fierce region has to offer.